Do you want to play Slither.io without using your own hands? Basically, when playing this multiplayer snake game online, your main control will be the mouse, meaning you have to use your hands to move the mouse cursor and help your snake warm around the game arena. But right now, we are going to play the game in such a completely new way, free your hands! Does it sound so fun? All the actions and movements of your snake will be directed by the Camera Mouse. Let’s find out how to use it now! Before using, you have to make sure that your computer is set on a table or a desktop instead of putting it on your lap or the bed. Also, you have to get a webcam built well on your lap or have a quality USB webcam placed nearby the monitor or even on it. Doing that will help it point at you. Now, let’s begin the Camera Mouse. There will be a mobile image popping up in the camera mouse window. 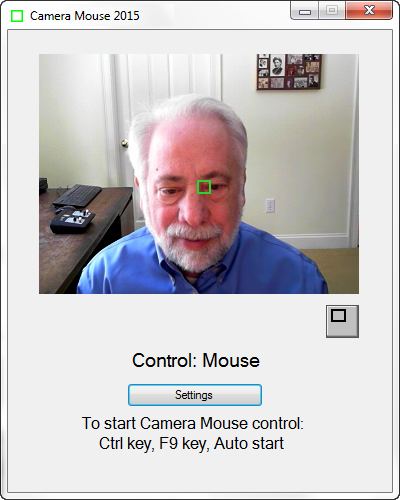 Click on a characteristic on your face for tracking by utilizing the mouse. You can utilize the internal corner of your eyebrow or your eye or the position between your nose and mouth. The feature that is being followed will have a tiny green square. When you start moving your head, that square will move as well. Tap key Ctrl or F9 on your keyboard, then wait for a bit, around 4 seconds without you moving the mouse. Now, the mouse cursor on the screen will be replaced and controlled by the camera mouse program. When your head is moving, the mouse pointer will move appropriately. If the mouse is moved, (or you hit key Ctrl or F9), your control will be back to the mouse. The settings can be modified by pressing the Camera Mouse Settings button located at the bottom of the window. The gains can be altered and clicking can be turned on. The clicking is finished utilizing “dwell time” by maintaining the mouse pointer throughout a diminutive location of the screen for a bit. You can also click commonly utilizing the mouse button or using a switch.